Yesterday we enjoyed our first Thanksgiving in California. We had a low key day since we are still moving the last of our stuff from the apartment to the house. (It is easy to forget how much stuff you have in your kitchen until it is time to move it all!) We enjoyed lunch and time with John's brother. We bought prepared food from Trader Joe's, so we did not cook a whole turkey this year. 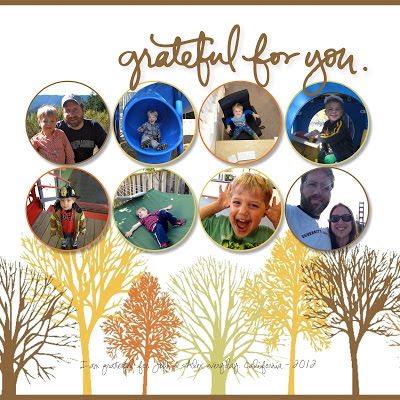 I am still setting up my craft space, but I did make a digital layout with some of my favorite pictures from 2012. I upgraded my Stampin' Up! digital software to MDS 2 since it is currently on sale. I am also grateful for the long weekend (and so much more)!